As an AT I work a lot of tournaments where I hear “Why am I injuring my ankle even though I wear an ankle brace?” As all AT’s know, braces are designed to lessen the severity should an injury occur, but are you recommending the most effective ankle brace to help prevent those injuries? Evaluating the most effective ankle brace starts with taking a look at it's design and ability to provide long-lasting joint support. Any ankle brace can feel supportive when you first apply it, but what happens to that brace in 30 minutes? An hour? Is there any support left? Here is a breakdown as to why some brace designs work well for long-lasting ankle support, while others fall short. Do You Restrict Range of Motion? Let’s start with bracing principles of effective design. A brace that moves freely with the natural joint motion will always be more effective at providing long-lasting support compared to a brace that resists the natural range of motion of the joint. Why is this? If a brace works against (or restricts) the material movement of the joint, it will stretch out, migrate and shift causing the brace to lose support rapidly. 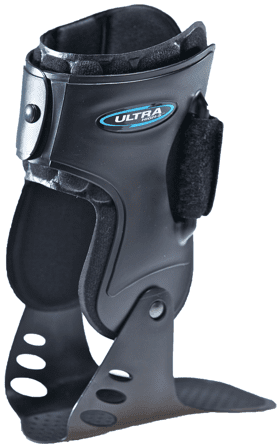 An example of an ankle brace that restricts normal joint ROM is the lace-up style. Lace-up ankle braces were first developed as a reusable tape job that the athlete could apply themselves. However, like a tape job, the lace-up loses a majority of its support in the first 15-20 minutes of activity. Do You Control Heel Movement? As athletic trainers we were taught that if you can control heel movement, you can control the ankle. You might say "Wait, lace-ups that have a heel lock strap can control heel movement." Which may be true for the first few minutes of activity, at which point the lace-up ankle brace begins to rapidly lose support. In theory it is true that if you can control heel movement then you can control the ankle, however it is unachievable with any ankle brace. Do You Use Hinged Braces? If you want to know what the most effective ankle brace design is at providing long-lasting ankle support, just take a look at the way knee braces are designed – with a hinge. When the brace is hinged and able to move with the joint, the straps stay securely in place maintaining long-lasting ankle support. By moving with the joint, the brace is not only providing long-lasting support, but it also does not negatively affect athletic performance. Although hinged ankle braces are able to move with the joint, there are still some negatives associated with them. Because most hinged ankle braces are made with a rigid plastic, they are bulky and uncomfortable to wear for extended periods of time. They are also more susceptible to cracking and breaking due to material fatigue. Unlike older versions of rigid, hinged ankle braces, our low-profile Ultra Zoom ankle brace uses an advanced material called Performathane which uses body heat to form-fit to the ankle. This new material overcomes the negatives of rigid hinged ankle braces by being form-fitting, flexible and extremely comfortable while providing the long-lasting ankle support only a hinge design can provide. Is Your Program Up to Date? Maybe you're already familiar with the best types of ankle braces for your athletes, but your program is in the habit of purchasing the same old lace-up style brace every year. As athletic trainers we usually want to try the brace out on our athletes before we commit to purchasing the product. You know that hinged ankle braces are better than lace-ups, but will your athletes wear them? Regardless of your situation, I would love to correspond with you about your ankle bracing protocol and how Ultra Ankle can help improve the effectiveness of the ankle braces you recommend to your athletes – just send me an email at support@ultraankle.com.